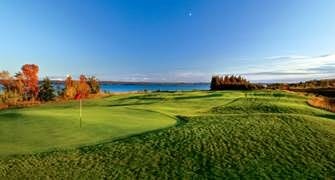 Looking for more Fall Golf Getaways look no further then Cobble Beach on the shores of beautiful Georgian Bay. An area I get to every year and will definitely be putting Cobble Beach on my must play list. Cobble Beach, the 600-acre golf resort community on Ontario’s stunning Georgian Bay, is offering play-and-stay packages through October and into November until the course closes for the season. Located just over two hours north of the Greater Toronto Area, Cobble Beach features a thrilling, links-style Doug Carrick-designed golf course with views of the bay from all 18 holes. Accommodations include The Inn at Cobble Beach -- 10 tastefully-appointed guest suites above the clubhouse – and The Cottages at Cobble Beach, each featuring two bedrooms and wet bars / living rooms. Inn packages start at $135 per golfer, for a one night stay and round of golf; Cottage packages start at $144 (based on quad occupancy, taxes not included). Two-night, two round packages are also available. Cobble Beach’s signature, Nantucket-style clubhouse houses a fully-equipped golf shop, Sweetwater Restaurant & Bar, resort-caliber spa and fitness center.